I’m so late to the party. I first saw Spectrum on Katie’s blog, loved the look of the brushes and the ethics of the brand… and then just never got round to ordering anything. Until the end of last year, that is. Spectrum make the most gorgeous, mermaid-esque make-up brushes you’ve ever seen in your life, with brightly coloured handles and bristles. Ombre is a favourite style of theirs but we’re not talking blonde and brunette, oh no — we’re talking blue and purple; pale pink and magenta; turquoise and black. Spectrum brushes are fun. Another feature that makes Spectrum stand out is their ethics. The brand is vegan and cruelty-free, with the bristles on each brush made from synthetic hair. I’d been after a crease brush for ages so this was the first brush in my basket! A flat brush with rounded edges, Cut Crease Police is a little smaller than my little fingernail and fits perfectly into the crease. I use windscreen wiper motions to apply eyeshadow back and forth until it’s blended nicely — a good way to define your eyes. The best brush I’ve ever used for blending eyeshadow, no question. Pretty As a Petal is bigger in real life than it looks on the website but luckily it’s not too bulky (in fact, the domed tip is a great shape for getting into the socket). This brush can be used to lay down your base eyeshadow or blend everything out for that smoky look we all know and love. I’m not into the heavily contoured look but a little shading underneath the cheekbones can work wonders — if you get it right. And I can never be sure if I have. Contour Queen certainly helps though. It’s a good size and shape to fit in the hollows of your cheeks and works equally well with cream and powder formulas. I’ll admit, I haven’t used this brush as much as I thought I would. Strong Finish is another brush which looks smaller on the website than in person, and unlike Pretty As a Petal this does affect how it works. I’ve tried using it for highlighter but it’s just a fraction too big, leaving me with a bit more shimmer than I’d like. Any ideas for other ways to use this brush would be appreciated! This is a powder brush but I don’t use it for finishing powder; I use it for a powder primer. Flawless Finish has good-sized bristles that hold on to a good amount of product — not too much and not too little — allowing you to dust your chosen product over the T-zone and gently buff it in. 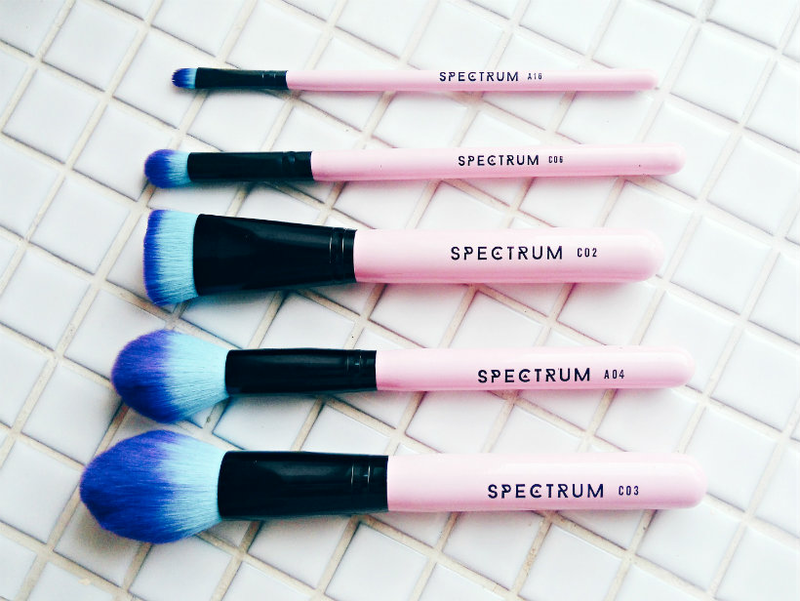 Have you tried any brushes from Spectrum? Are there any must-haves I should know about? Let me know in the comments!